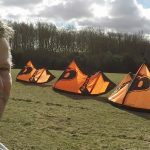 Kitesurfing Safeties: Why you can't learn kitesurfing on your own! The kitesurfing control bar system. In kitesurfing, we use a control bar system to pilot the kite. It is a system of front lines and back lines. Front lines are connected to you, by your harness, on one side and to the front of the kite on the other side. Back lines are connected to the bar, on one side, and to the back of the kite on the other side. The first point of it is to change the angle between the kite and the flux of air the kite is feeling. You need to give the right angle to the kite for it to fly well. The second point is to steer the kite on the right or on the left. Now, why can’t you learn kitesurfing on your own. Well, because of the control bar system we are using, we are attached to the kite. If you loose control, and the kite keeps pulling, you will be pulled by it where ever it goes and you will get hurt. Of course there are safeties you can use to stop that, but these are active safeties, you need to activate them for them to work and here is the problem . Let’s talk about Kitesurfing safeties. When we are flying a kite, there are three safeties we can use whenever we loose control and/or are in danger. We call them First safety, Second safety and Third safety, because you only can use them one after an other. The first safety is to let go the bar. When you let go of the bar, the angle between the kite and the flux of air reduced and so the lift and the drag created on the kite reduce also (the kites we are using have profile wings, they get lift and drag when wind goes through them, like the wing of a plane or a bird ). This reduces a lot the tension in your lines and you don’t feel the kite pulling anymore. This first safety is used when you lose control. For a beginner, you might make a mistake piloting the kite and suddenly you are getting too much pull from it, you loose control then loose balance. For a intermediate or advanced rider, you might try a trick, loose balance then loose control. In both cases, you let go of the bar, the kite will stop pulling, and the crash, if there is one, won’t be as hard. If you don’t let go of the bar, the kite will keep pulling and you will crash hard with risk of injury. The first safety doesn’t kill the kite, it will still have a bit of lift and drag, but not enough to pull you. The kite can still relaunch, sometimes on its own, so you have to be watchful. If the kite is still pulling after letting go of the bar, you should go to second safety. The second safety, is killing the kite (no more lift), and you do it by pulling the safety line. A kite fly with four lines (sometimes five), two at the front, two at the back. A safety line is a line connected to one or two lines of the kite, and when you pull it, the kite is only in the air on one or two lines, and it can’t fly this way so it dies. The way it works is we have a leash connected on one side to our harness, and on the other side, to the safety line. We have a Quick Release Safety System (QRSS) on the hooked in system on the front line. 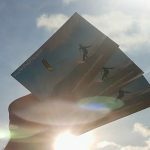 This is a quick and easy system to detach you from the kite. 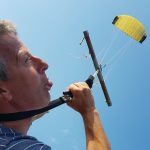 When you activate your quick release safety system, you will be only connected to the kite by a leash, that then pull the safety line and kill the kite. Strangely, this second safety system is also the primary safety, the one you use when you are in danger. So you should always have it in the back of your mind. If after using the second safety, the kite is still pulling you by the leash, you go to the third safety. The third safety is the Quick Release on your leash that enables you to disconnect yourself permanently from the kite. It means than you are not at risk from the kite but it also means that the kite and the lines behind it will be travelling on their own with a risk to others around you. So you should keep this in mind. 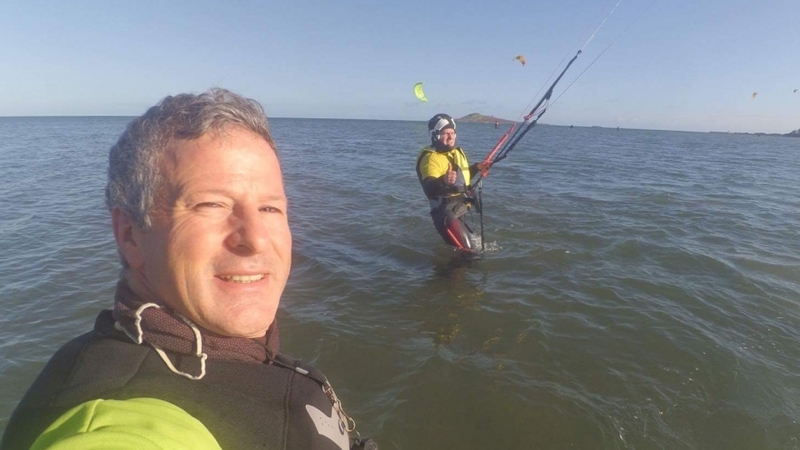 Why you are not using your kitesurfing safeties! Now than I am aware of these three safeties, why can’t I learn kitesurfing on my own. You understand now that the primary safety in kitesurfing is the second safety. It the one than can kill the kite and stop everything. You understand as well that to get to the second safety, you have to go through the first safety that is to let go of the bar. You need to know this as a beginner. As someone who is starting kitesurfing, at some stage you will loose control, loose balance, get scared or swallow a bit of water. Your first reflex will be to grab what you have in front of you, and that would be the bar! It is a natural reflex, and it will take a while to change this reflex of grabbing into a reflex of let go (or at least pushing the bar away from you). The reason it is confusing for a beginner is because the bar is being used for getting power but as well to keep control of the kite (steering the kite). If you were told to let go of the bar it may feel like letting go the steering wheel of a car when you are driving, you can’t understand it, it doesn’t feel right. That’s why you can’t learn kitesurfing on your own. You won’t let go of the bar in the stressful state of mind without supervising. This is what make kitesurfing dangerous to learn. 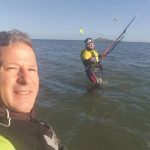 You have to learn with a instructor who will use appropriate trainer kites when you start on the beach and small beginner kitesurfing kites, when you start in the water. This way, when you won’t let go the bar, all will happen is the kite crashing but you not hurting yourself. Then you will build up your piloting skills, making you loose control less often with no need to use your safeties. This first safety will take time to come to you. But knowing that it is not your reflex, and that you have to go through it to get to the primary safety (second safety) should be in your mind at all time. So take lessons, with me or with another qualified instructor. It is the only way to get into this wonderful sport!